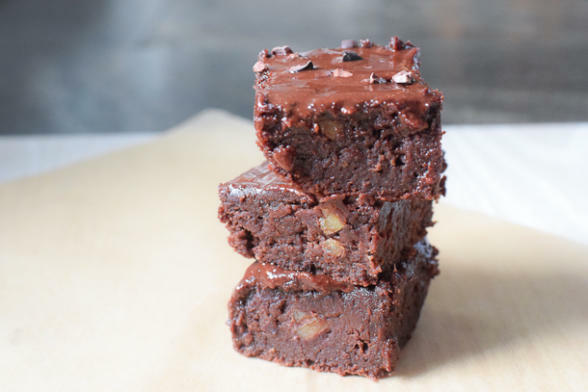 When I taught this black bean brownie recipe in February of 2009 (yes, 10 years ago! 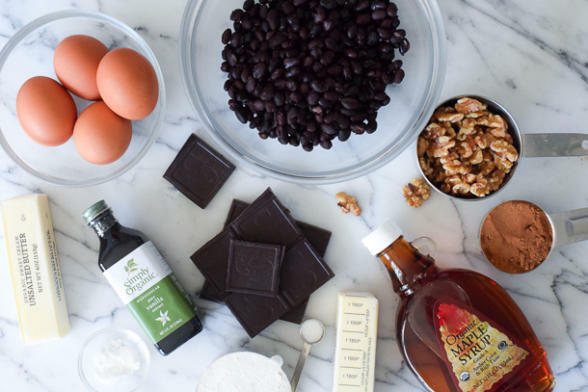 ), the idea was trending so much that I thought the recipe would get lost in all the black bean brownie hysteria. But just like fashion, sometimes trends make a comeback or sometimes when you take something out of the closet that has been sitting there for a while, it looks fresh again. That’s what happened with this recipe which I hadn’t made in many years. I saw it one day as I was flipping through my cooking class recipe binder and realized I had never posted it. I remembered when I taught it and how CRAZY my students thought I was to use black beans in brownies. Now, no one would give it a second thought. I have a white bean blondie recipe in my cookbook, as well as a chocolate hummus recipe (which uses chickpeas), and a black bean cookie dough bites recipe. On this site, I have a white bean coffee cake recipe. Beans in desserts are a thing around here! Beans add moisture, creaminess, as well as protein and fiber. I am a fan of all legumes whether they are in my soup or in my desserts! 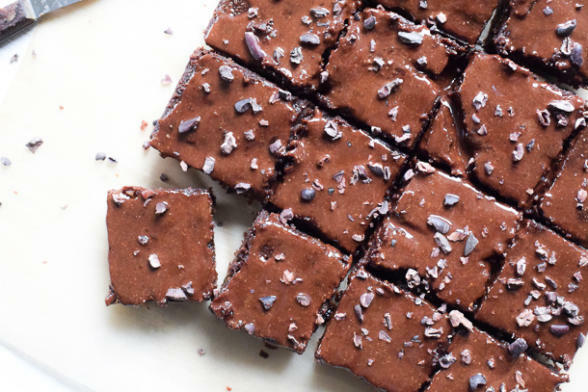 These brownies are not exactly like “normal” white sugar and white flour brownies. They’re fudgier, but with a really good chocolate flavor and they hold up really well in the fridge (although they can also stay perfectly well at room temp in a lunchbox.) Something that I added to the recipe since 2009 is this chocolate “ganache” which I adapted from a Deliciously Ella ganache. It’s not overly sweet and just adds a really yummy texture to the brownies. You could also stir in cacao nibs into the batter or freeze-dried raspberries or a high quality chocolate almond butter or peanut butter cup chopped up. Originally I taught the recipe in a 13 x 9 pan, but that’s too much brownie to have lying around tempting me. I’ve cut back on desserts significantly in the last 10 years, and I try to eat them very occasionally, as in a couple times a week or less. It doesn’t always work out that way, especially if I’m recipe testing. But cutting back on concentrated sweeteners (even maple syrup) has proven to me to be the way to feel my best. When I do want a treat, a small square of this feels decadent and satisfying without spiking my blood sugar too much. 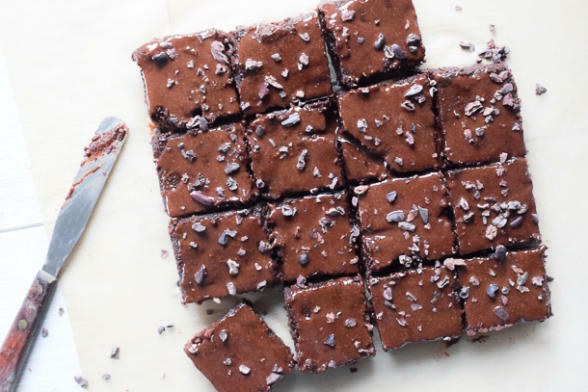 Serves: 9-16 brownies, depending how you cut them! Preheat the oven to 325 degrees. Line an 8x8-inch baking pan with unbleached parchment paper. Melt the chocolate and butter in a double boiler or in a small glass bowl over a pot of simmering water. Do not allow the water to touch the bowl. Stir with a wooden spoon or spatula to the melt the chocolate completely. Place the beans, ¼ cup of walnuts, vanilla and half of the melted chocolate mixture into the bowl of a food processor fitted with a steel blade. Blend about 2 minutes, or until smooth. The batter should be thick and the beans smooth. 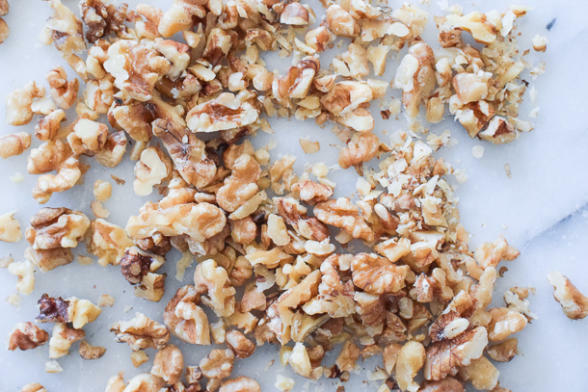 In a large bowl, mix together the remaining ¼ cup walnuts, remaining melted chocolate mixture, coffee substitute and salt. Mix well. Add the bean and chocolate mixture to the coffee and chocolate mixture. Stir until well blended. In a separate bowl, with an electric mixer beat the eggs until light and creamy, about 1 minute. Add the maple syrup and beat well. Add the egg mixture to the chocolate mixture. Then add the flour and baking powder and mix by hand until just blended. Pour batter into the prepared pan. Bake for about 30 minutes or until the brownies are just set. The top may look a little shiny, but they will continue to cook after they are out of the oven. Let cool in the pan completely before cutting into squares. 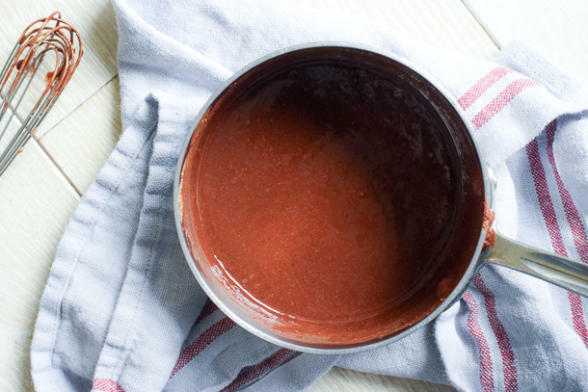 Make the ganache: Add the cacao, coconut oil, almond butter and maple syrup to a small saucepan on medium-low heat and mix until fully melted and combined. Pour the chocolate on top of the brownies and spread evenly across. Cut the brownies into squares and serve. Option to top with cacao nibs and/or flaky sea salt. These brownies slice better if refrigerated at least a few hours. Store, covered in the refrigerator or freezer. I had a question…should the brownies cool completely in the pan then pour the ganache on and then put in the refrigerator before slicing OR pour the ganache on the warm brownies, cool completely in pan, put in frig for awhile before slicing. can you sub apple sauce or pumpkin purée for the butter? I’m not sure since I haven’t tried it, but I have a feeling it would work fine even if the texture is not exactly the same.